You’re Invited to a Family Event! Child care and activities will be available for s​chool aged children during the meetings. 5:00-5:30pm ~ Dr. Bruce Thomas (ISD 318 Superintendent) will be on site to present information and answer questions from attendees. 5:30-6:00 ~ Mr. Martinson (Murphy Elementary School Principal) will share information about a school wide social emotional learning (SEL) program being implemented at Murphy Elementary School and how you can use this to help you at home as well! Learn more about the program including specific skills and language you can use at home to help children problem solve and how to calm down. Second Step: Second step is a school wide approach and curriculum for students in grades K–4. Utilizing weekly lessons, students continue developing their social-emotional skills—including making friends, managing emotions, and solving problems—to set them on the path for social success and academic readiness. www.secondstep.org ~ Access codes will come home in Tuesday Folders on Tuesday, October 20th. In the month of September, our schoolwide theme was a welcoming place where every student feels like he or she belongs. In our morning announcements we reminded students to welcome others and act and speak in safe, respectful, and responsible ways. In addition we reminded students of our school rules. In October each classroom will begin teaching the Second Step program, which includes lessons that support these behaviors. 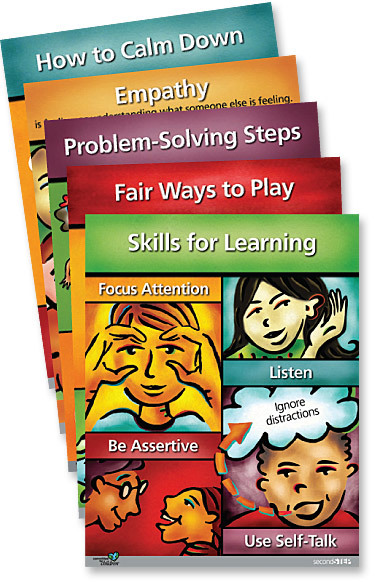 For October, our schoolwide theme will be skills for learning: listening, focusing attention, using self-talk to stay on-task, and being assertive when asking for help with a learning task. In our morning announcements and school assembly, we’ll be reminding students of these skills, which help students be successful learners. Second Step lessons teach skills for learning. You’ll be receiving Home Links describing why these skills are important and including fun activities to do with your child to practice them. We hope you enjoy them! Please tell your child’s teacher if you’d like more suggestions about supporting skills for learning at home.